I've been getting over a bad cold the last few days and feeling a lot better this morning, I badly wanted to rejoin the world and check out the LA Marathon festivities in Santa Monica. But a quick check on Google Maps showed red and red & black on most side streets and the 10 freeway leading to Santa Monica so I scrapped that idea. 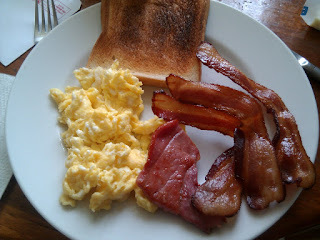 Instead, I decided to finally break open the pound of Country Smoked Bacon, Country Ham and Strawberry preserves I got by mail order from Loveless Cafe in Tennessee. Well, it wasn't exactly breakfast in bed since I had to cook it but I hardly ever cook breakfast at home on the weekends so this was as special as breakfast in bed. Plus, who really wants to eat in bed and not brush their teeth and wash their face first? Frying the crispy bacon filled my apartment with wonderful hickory smoke and that ham was all salt-cured deliciousness. I also slow-scrambled some eggs on very low heat so they were smooth and tender (high heat gives you rough and rubbery eggs). 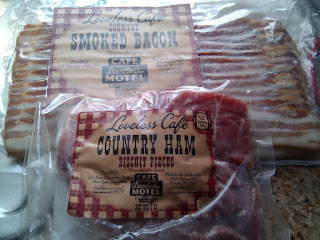 You can order bacon, ham, biscuit mix, preserves and all kinds of other goodies from Loveless Cafe. Their bacon is sugar-cured and hickory-smoked with no water packed in. The ham is aged for 9 months and also hickory-smoked. The jar of strawberry preserves is really good too - just strawberries and sugar and no other additives. I still have a pack of unopened biscuit mix from Loveless...waiting for a special occasion or a big party to bake some. Well played. I'd rather shower first, too.